Born in 2008 from a TIME Magazine piece about the rise of craft spirits, Smooth Ambler was created by Tag Galyean and John Little. Based proudly in Greebrier Valley of West Virginia, along the Appalachian mountain range, these Americans take their distilling very seriously. Using state of the art equipment and only the finest of natural, locally sourced ingredients, the Smooth Ambler product is nothing to be balked at. The Smooth Ambler Old Scout Rye, a nod towards Scottish and Irish traditions of independent bottlings is a great Rye Whiskey that really gets to the heart of this strain of Whiskey. Made of corn, rye and malt, all the ingredients are there to make a fantastic taste exploration on Rye Whiskey! "Old Scout 7 YO Rye Whiskey that you are selling at Flaviar was made in an old Seagram’s facility. It is high proof and bottled at a mature age. We don’t filter any of our Whiskey to leave it is as close as possible to the original product that the distiller made. This makes it a wonderful Whiskey; it has oils and fatty acids - occasionally, you’ll see a little bit of flock, it’s fatty acids coming together. A big distiller would get rid of those with chill filtration, but we leave them. This leaves a big creamy mouthfeel when you drink it. Cinnamon and ginger biscuits - wonderfully sweet with some yummy spice underneath. Luxurious caramel, cane sugar and vanilla. Then there's the spice coming through once again, with rich rye in tow. A hot finish of cinnamon, more rye and maybe even a little coffee. Cinnamon, Rye, Brown sugar, Caramel, Vanilla, Ginger, Biscuit, Coffee, Sweet. 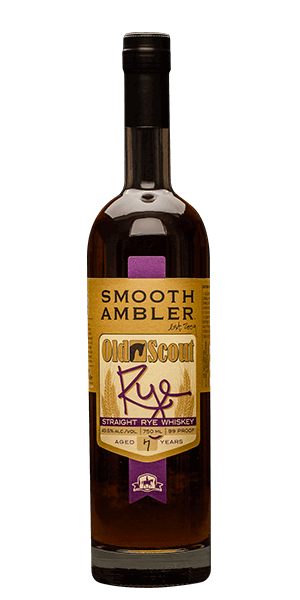 What does Smooth Ambler Old Scout 7 YO Rye taste like? The Flavor Spiral™ shows the most common flavors that you'll taste in Smooth Ambler Old Scout 7 YO Rye and gives you a chance to have a taste of it before actually tasting it. Floral notes. Oak. Rough but a long lasting finish.